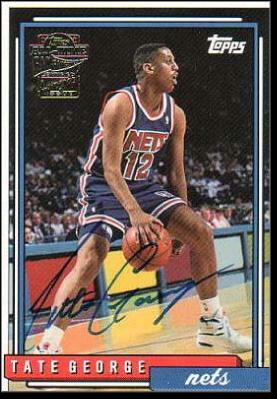 Tate Claude George was born May 29, 1968 in Newark. Tate attended Union Catholic in Scotch Plains, a suburb 20 minutes west of Newark. He played guard and forward for the Vikings. At 6–5 with better-than-average ball-handling skills, Tate was on everyone’s radar. USC and Marquette gave him the full-court press, but in the end he chose the University of Connecticut, which had a reputation as a Big East doormat. Tate liked the campus atmosphere and knew he’d get to play right away. 6 assists a game. Over his four-year varsity career, Tate averaged 9.7 points, 5.3 assists and 1.6 steals per game. Tate was one of the players who helped turn the UConn program around. In his sophomore year the Huskies fashioned a winning record and earned a bid to the NIT Tournament. They scored one narrow victory after another and won the tournament, vanquishing Ohio State in the final, 72–67. Tate’s biggest moment came during the 1990 NCAA Tournament. The Huskies trailed Clemson 70–69 with 1 second left in the East regional semifinal at the Meadowlands. Scott Burrell threw an 80-foot pass from underneath UConn’s basket to Tate, who caught the ball and let fly a turnaround jumper from the right corner. The ball hit nothing but net. Three months later, Tate was the property of the New Jersey Nets, who took him with the 22nd pick in the NBA Draft. Stuck behind the likes of Reggie Theus, Mookie Blaylock and Drazen Petrovic, Tate didn’t see much playing time. The Nets waived him after three seasons. He stayed in shape playing in the CBA, and tried to catch on with the 76ers and Bucks without much luck. The real estate boom in New Jersey gave provided Tate with a good business opportunity. After leaving basketball, he formed The George Group in West Orange. The company focused on constructing affordable housing in his old hometown, as well as other commercial ventures. He also did TV work for ESPN. In 2011, Tate was among a group of college and football and basketball stars bringing suit against the NCAA and its licensing partners for the unauthorized use of their images in memorabilia and video games.